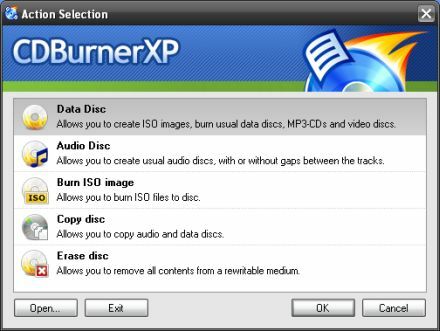 CDBurnerXP is one of the powerfull free disc burning application for Windows. It handles all the tasks you would expect from a commercial application like Nero including burning data, audio, or ISO discs. It won’t burn video DVDs unless your videos are already formatted for DVD creation. But there’s free software to do that too. Sure, the price is right, but there’s another thing that sets CDBurnerXP apart from most commercial apps: it comes in a portable version. In other words, you can download, unzip, and run CDBurnerXP from your hard drive, a USB flash drive, or any other media. There’s no need to install it. The portable version of CDBurnerXP isn’t updated as frequently as the normal version. But you can always find the lastest build on the portable download page. The latest version of CDBurnerXP is 4.3.7 and contains some bug fixes you won’t find in the most recent portable version which is 4.1.2.